New Tax Plan and You! As of January 1, 2018, there are some major tax changes that small businesses and property owners can get excited about! To start the list off is the new Pass Through Tax Deduction. 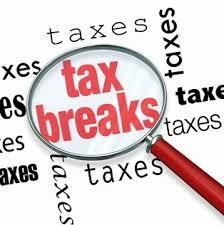 This new deduction, if eligible, can reduce your passive taxable income by 20% right off the bat, and you can take this deduction whether you itemize your deductions or not! There are new rules pertaining to the Section 179 Deduction, as well as decreased tax rates for some brackets. This article does a fantastic job of laying out these new, big changes that are happening in the tax world. Take the time to read it and save some money this coming year! The Tax Cuts and Jobs Act (H.R. 1, “TCJA”) has been passed by Congress. Landlords are among the biggest winners under the new law. Virtually all landlords will save money--many, to quote our President, will save “bigly.” Enjoy it while you can. The main provisions of the TCJA affecting landlords are discussed below. Except where otherwise noted, all of these provisions take effect on January 1, 2018, so they will not affect your 2017 taxes. For landlords, the most stunningly good provision of the TCJA is a new tax deduction for owners of pass-through businesses. This includes the vast majority of residential landlords who own their rental property as sole proprietors (who individually own their properties), limited liability companies (LLCs), and partnerships. With these entities, any profit earned from the rental activity is “passed through” to the owner or owners’ individual tax returns and they pay tax on it at their individual income tax rates. Example: Alice, a single person, owns a duplex she rents out. In 2018, she earns a total profit of $20,000. Alice is a sole proprietor. She reports her rental income and expenses on IRS Schedule E. She adds her $20,000 rental profit to her other income and pays tax on it at her individual tax rates. In 2018, her top tax rate is 24%, so she pays $4,800 in income tax on her rental profit. Example: Assume that Alice from the above example had $100,000 in taxable income in 2018. Since she was a sole proprietor, she may take a pass-through income deduction of 20% x $20,000 rental income = $4,000. This saves her $960 in income tax. This deduction is phased out if your income exceeds the $315,000/$157,500 limits. It disappears entirely for marrieds filing jointly whose income exceeds $415,000 and for singles whose income exceeds $207,500. This is a personal deduction you can take on your return whether or not you itemize. However, it is not an “above the line” deduction that reduces your adjusted gross income (AGI). Since most residential landlords have no employees, the 25% plus 2.5% deduction will be of most benefit to them. Example: Assume that Alice from the above examples earned $250,000 in total taxable income during 2018. She has no employees in her rental business. Thus, her pass-through deduction is limited to 2.5% of the purchase price of the long-term property she uses in her rental activity. This consists of her duplex, which she purchased five years ago. Her depreciable basis in the duplex (purchase price minus value of the land) is $100,000. Her pass-through deduction is limited to 2.5% x $100,000 = $2,500. The 2.5% deduction can be taken during the entire depreciation period for the property, which is 27.5 years for residential property. However, it can be no shorter than 10 years. A provision of the tax code called Section 179 enables rental business owners to deduct in one year the cost of personal property used in a rental business, such as furniture and appliances. During 2017, the maximum amount that can be deducted under Section 179 is $500,000. Starting in 2018, the Section 179 maximum is increased to $1 million. The $1,000,000 amount is reduced (but not below zero) by the amount by which the cost of property placed in service during the year exceeds $2,500,000. One significant limitation on Section 179 is that is has never been available for rental property owners to use to deduct the cost of personal property used in residential rental units. In a major victory for landlords, the TCJA eliminates this restriction starting in 2018. Bonus depreciation may not be used for real property, except for real property improvements such as landscaping or grading, and other components that have a depreciation period of 20 years or less. Thus, landlords may not use it to deduct the cost of their rental buildings or major building components. However, landlords can use bonus depreciation to fully deduct in one year the cost of personal property they use in their rental activity, such as appliances, laundry equipment, gardening equipment, and furniture. But landlords can often do this already under existing provisions in the tax law—for example, the de minimis safe harbor enables landlords to fully deduct in one year any personal property that costs $2,500 or less. Section 179 can also now be used. Listed property must be used over 50% of the time for business to qualify for bonus depreciation. Listed property includes cars, and entertainment property like televisions and cameras. Computers were classified as listed property as well, but the TCJA removes them from this classification starting in 2018. Thus, bonus depreciation may be used to deduct computers used less than 50% of the time for a rental business. As you probably know, people who own their own businesses are required to pay Social Security and Medicare taxes on their net business income, as well as income taxes. These taxes are commonly referred to as self-employment taxes. One of the nice things about owning rental property is that rental income is ordinarily not subject to self-employment tax, only income tax. However, there is one exception for landlords who provide substantial personal services to their tenants and are effectively running a bed and breakfast business or hotel, not a normal rental operation. The House version of the TCJA contained a provision that removed the rental income exemption from self-employment taxation. However, as many tax experts expected, this was dropped from the final version of the bill. Thus, landlords who do not provide substantial personal services to their tenants remain exempt from having to pay Social Security and Medicare tax on their rental income. These rates are scheduled to expire after 2025. The vast majority of rental activities qualify as businesses or investment activities. However, rentals that are not profit-motivated must be classified as not-for-profit activities, also called hobbies. Under prior law, expenses from a hobby could be deducted as a personal itemized deduction on IRS Schedule A to the extent the exceeded 2% of the taxpayers adjusted gross income. However, such deductible hobby expenses could not exceed hobby income. The TCJA completely removes the personal deduction for hobby expenses. This means that while the income from a rental activity classified as a hobby must be reported and tax paid, no expenses may be deducted.